You've never been in a donut shop after dark. That's probably a good thing. My first jam, also done solo - I am equal parts thrilled and exhausted. Generated theme from Episode 13: The Undo-Nuts. 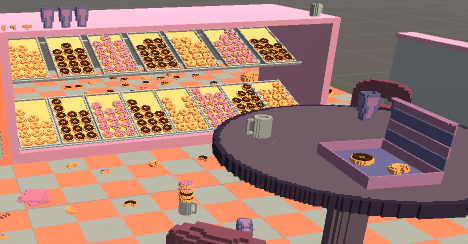 Update 1: Made donuts more aggressive, and a secret ending? Along with a few other audio / bug fixes. This game is chopping up my pc, I hit the counter and it was running at like 1 FPS. Of course I could not find the secret ending. Good idea though. omg! I find it very funny. It's a bit confusing at the beginning what you mean to undo the donut, but IT DOESN'T MATTER. It has the humor and groove that is just right for a game about donuts. Like the music as well. Did you make the music? Thanks for making the game! Glad you enjoyed it. I just added some tweaks and a new ending too. And yes, I made the music myself. Thanks! Yes! You have it! More!